Coconut oil for hair. Is it suitable for damaged hair? Coconut oil is highly popular natural cosmetic used for care. We know its impact on hair. We know the best methods of its use. However, often enough we choose it when, for example, we want to regenerate hair ends in spite of coconut oil and damaged hair not being the greatest match. There’s no elevator to take you to the beauty level! You need to take the stairs. The choice of appropriate oils for everyday hair care is a key matter. Use of incorrect cosmetic may result in no effects whatsoever or even worsening of the hair condition. Unfortunately, there are many myths flying around on the subject of which hair should be treated with coconut oil. Which hair type is the one to benefit from the use of coconut oil? Hair oil treatment of damaged hair with coconut oil is not a good idea. Mostly due to its composition. 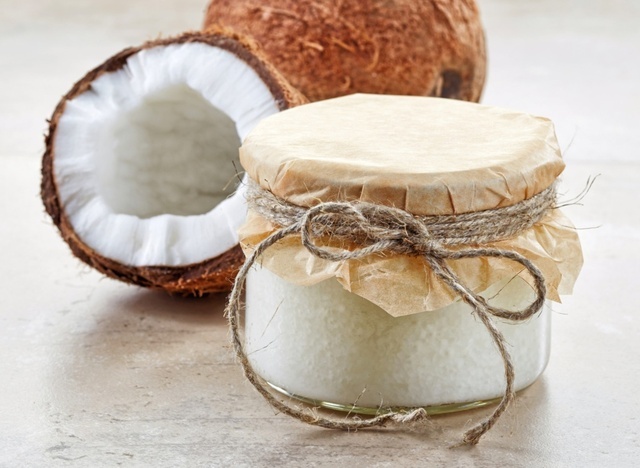 Coconut oil contains large amounts of saturated fatty acids. In the meantime, high porosity hair needs more unsaturated fatty acids which in vegetable butter is contained in trace amounts. For this reason, coconut oil for high porosity hair is not going to work unless used as a macerate. What can happen when you use coconut oil on damaged hair, for example, unknowingly? It is highly probable that the strands’ reaction to this component will be rapid. The result is frizzy, dull and stiff hair, prone to breakage. There is no way you will make combing easier or regenerate hair ends. Coconut oil protects mostly from moisture loss. For this reason, it is best used when hair is healthy and you want to preserve the good condition and support its growth. Then the properties of coconut oil may turn out to be invaluable. The tiny particles of coconut oil are not able to seal the weakened structure of damaged hair. Low porosity hair is thick and heavy. They tend to absorb water much longer and equally long they dry. This hair type is healthy, but quite stiff and happens that it is not easy to style it. Frequently, hairstyle loses its shape and curls straighten after an hour. Such hair is usually well taken care of and is difficult to damage. It is known that such hair will not need so intense hydration and regeneration, as damaged and dried up hair with high porosity. Nonetheless, it most certainly requires nourishment with right ingredients that will support healthy hair growth and protect it against the unfavourable impact of atmospheric factors and damages. Thick hair closely adheres to the scalp. For this reason, processes occurring on its surface can be disrupted. However, ladies with this hair type shouldn’t stop taking care of it or limit hair care to shampoo and lotion. Low porosity hair requires protection and nourishment as well. Conditioning of this hair should be adjusted to needs of hair with low porosity. The correct care can be provided by the coconut oil. Coconut oil will deliver low porosity hair with a full range of essential minerals such as potassium, magnesium or zinc. What is more, small particles of coconut oil can easily penetrate inner structures of low porosity hair and protect strands on the outside by sealing hair cuticles. This is why coconut oil not only takes care of hair but also blocks toxic particles, that could get inside hair structures and damage them. Coconut oil contains about 90% of saturated fatty acids, that have small particles fitting perfectly just slightly raised cuticles of low porosity hair. Because hair oiling is based on the application of oil to the hair, but also scalp – coconut oil will also take care of scalp, nourish, cleanse it and normalise sebum secretion. Not many people know that coconut oil helps also to eliminate dandruff. Coconut oil — for dry or damp hair? Then there’s the matter of which hair can actually benefit from the use of coconut oil. It all depends on the method you choose. The greatest advantage of hair oil treatment is the multitude of possibilities it has to offer. Coconut oil can be used both on dry and damp hair. However, you must keep in mind that the effects of each hair care treatment can vary. Coconut oil is easier to absorb when you warm it up before applying to hair. Both water and higher temperature make it easier for the oil to get absorbed. If applied to damp hair, you will avoid greasy hair and the oil will be easier to wash down. It does not mean it cannot be used dry. It can, but then its application will be more difficult. If you look for a golden mean, you should choose high-quality products with coconut oil in the composition. When combined with light oils and other ingredients, it will work definitely better, will be easier to absorb and will work more effectively. There will not be any more doubts as to whether you should apply coconut oil to dry or damp hair. COCONUT spray hair oil – delicate care.